Like the world of smartphones and tablets, where there are so many choices and options that trying to highlight them all is an experiment in confusion, the world of digital cameras and video cameras presents a multitude of devices. For this wrapup, then, we’re presenting a bunch of materials that the photographer and/or videographer would like to include in their arsenals, with a focus on things that let people watch videos or produce photos easier. Buy this for: The action-oriented video guy who can’t find a cameraman to help him. Here’s a gift that will make many people who shoot action-oriented outdoor video happy. One of the big problems that us videographers on a budget have (and, yes, that includes me) is the lack of a crew for field shoots. Robotic tripods have been around for sometime -- they’re seen all the time in TV studios, and allow the director to move the camera without having to tell a cameraperson (these are becoming rare regardless) to “pull back/pan left/focus on the whatever”. In short, robotic cameras provide a degree of automation and assurance that is simply priceless. But, as you might guess, these have historically been, um, pricey. Enter the SoloShot “Personal Robotic Cameraman”, a remote-controlled servo system that allows a camera (not included) to track the moving person or object it’s shooting with no additional staff required -- in other words, you can star in your own action video. The unit is provisioned as a tripod (carrying bag included) that’s about two-feet long when folded, but up to five-feet high when deployed, and a transmitter that comes with an elastic armband. The robotic element is at the top of the tripod, with a standard one-fourth-inch thread above that for attaching a camera. The user then wears the transmitter that indicates where the camera should be aiming, and that’s about it. The SoloShot will automatically pan across 360-degrees as it follows the transmitter. The transmitter is claimed to be “extremely waterproof” against both fresh- and saltwater, although we didn’t test that one -- it’s getting cold here in New England, and the surfboard’s been put away for this year. Surfing, by the way, is an excellent example of an application for this product. The SoloShot robot is made from ABS and is bright safety orange in color, so it’s easy to see from a distance. And that distance, according to the specs, can be up to 2,000 feet between transmitter and robot, with a maximum pan speed of 40 degrees per second. There’s a bright but narrow-beam green LED on the robot so the user can easily determine that the device is pointing in the correct direction. Essentially any camera can be mounted, include iPhones and iPads with an appropriate adapter (see the review of the Padcaster in this year’s Gift Guide). The transmitter and receiver magnetically mate with each other for easy recharging, and on the order of five hours of battery life is claimed. OK, it’s not a real robotic camera, and there’s no way to monitor, in most cases, exactly what’s being shot. The manual warns of an up-to-15 minute latency period between powering on and use, which is potentially painful, but pairing after that is easy. The unit will not perform well (i.e., may point in the wrong direction) with less than 200 feet between transmitter and receiver. And I think I’d also prefer a unit of this type that can be mounted on any tripod, as I already have several of these (as any good photographer or videographer would). But for a wide range of applications, the SoloShot should provide hours of fun -- and perhaps even productivity -- for the videographer on your list. Buy this if: You are a gamer who likes creating videos of your awesome gameplay to share with the world on YouTube. Gameplay videos are huge on YouTube -- whether it’s someone offering suggestions on how to get past a certain level, or just watching other players navigate through a game. There’s a cheap and easy way to get the footage you need -- point a camera at the TV screen and hit record. But if you really want some good footage, you’ll need a video capture device. Previous devices I’ve tried for that purpose have not been easy to install and have had performance glitches/issues that prevented me from really appreciating this market segment. Fortunately, Diamond Multimedia has excelled with their latest device, the GC1000. The unit sits as a passthrough device between your video game console (Xbox 360, PS3, etc.) and your TV. The device is able to capture the content and then send it, via a USB 2.0 cable, to a connected Windows computer. The company says it supports Windows XP, but I’d recommend a system with Windows 7 or Windows 8 with a lot of RAM and a really good processor. The GC1000 can utilize HDMI connections from the game console, and has HDMI output to the high-def television as well -- but it also supports component (YPbPr), composite (red, yellow, white) and S-video inputs. Those additional inputs are nice if you feel like capturing video game content from a Nintnedo Wii, for example. Included software lets you see the video game content on your computer screen and hit a record button to start capturing the video footage to your PC. It stores the video in MPEG-2 format, so if you want to edit the video later on a Mac, you’ll need additional software to convert to a compatible format. The Diamond software includes a direct upload to YouTube if you want to upload footage without adding commentary or edit it. The system won’t capture copyrighted material, like movies or TV shows, so don’t bother trying to load up Netflix and capture Breaking Bad via the device. However, I was able to capture some footage via entertainment channels via my Xbox 360, such as movie trailers and web clips made available via the console. As long as the video source includes those connections, you should be able to use the device to capture that footage (again, apart from the copyrighted movies/TV shows / etc.). For example, if you’re still waiting to convert your wedding video from a DVD or even videotape, the unit should work just fine digitizing that. That is, if you still have the VCR and cables. For the most part, though, you’ll use this device to capture gameplay footage. As long as the computer you have is relatively new and powerful, you should have no problems showing off your mad gaming skills. Buy this for: Novice-to-intermediate photography lovers who want to go beyond their smartphone camera. A lot of people don’t understand why I would want a real camera when all smartphones have a built-in camera. The reason is that I love pictures, but I’m a pretty terrible photographer. I feel that a real camera makes my pictures look great, whereas my phone shows my lack of photo skills, possibly even making them worse. The shutter speed on my phone’s camera is so slow that I have 368 blurry baby pictures on my phone right now. I don’t get that with a real camera. With the X2600, I have tons of crisp, clear, lovely photos, even in low light! 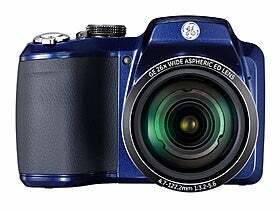 This 16-megapixel camera with a 26x optical zoom is great! A few of my favorite features with this camera include the ability to use real batteries, to focus before taking a picture, and to use it very pared down and simply or to adjust all of the functions manually. By real batteries, I mean that it takes AAs instead of a lithium ion battery. If you’re at a national monument and your lithium ion camera battery dies and you don’t have another, you’re pretty much out of luck. When you need more AAs, you can pretty much find them anywhere. The “focus-before-you-shoot” feature is nice, especially as I’ve been taking photos of my new baby. I can focus the camera and wait for her to do something super-cute (or just have her look at the camera and smile) before I take the photo. This really increases the photo’s quality. Meanwhile, if someone else is using the camera and they don’t know about the “hold it halfway down to focus” option, the camera still does a good job of focusing and taking a nice shot. The X2600’s preview screen offers a clear view that only shows the image that you’re aiming at, or you can choose a giant menu filled with detailed options (aperture, shutter speed, white balance, ISO, contrast, etc.) that overlay the image you’re shooting. The camera supports Eye-Fi cards for wireless transfer of photos, but it doesn’t come with a card (sold separately). In fact, it doesn’t come with any SD cards, so make sure you buy an extra one if giving this as a gift. Other features include a 26mm wide angle lens, facial recognition, red-eye removal, 720p HD video, HDMI output, and image stabilization. It also has a feature it calls “pancapture,” which is like panorama, except that instead of standing back and trying to capture one long image, the camera has you move along the plane you want to capture and turns that into a photo. One quick downside - the sizable camera won’t fit into a pocket like other, smaller point-and-shoot models. You’d need a decent-size purse or bag to carry this in, and you can’t swap out lenses, as we’ve seen on similar-style models. Buy this for: Someone who wants to monitor locations remotely but without breaking the bank. Wireless cameras are valuable in so many situations -- keeping an eye on a baby, checking on what the family pet might be getting into, security monitoring, and many more. Of course, wireless means that connecting to the network is easy, even as (it’s always important to keep this in mind) AC power is required. And a key feature that I always look for is cloud-based monitoring and management, so I can control the device and view whatever it’s seeing on smartphones and other mobile devices, right over the Web. That’s what’s so cool about the D-Link DCS-930L -- it has all of this, and more, at a very low price. It’s 802.11n (2.4 GHz. only, though), with WPA2 security. The 640x480 (VGA) resolution is limited to 20 fps, but 320x240 is adequate for many applications. OK, then - this is an inexpensive unit. There’s no pan or tilt, or IR illumination for night use, but there is a 4x digital zoom of modest benefit (it’s grainy) and one-way audio. But since many applications require none of these features, this product can in fact be a real bargain -- and a great gift for just about anyone on your list. There’s a CD with software for Windows users, but this can also be downloaded, and Mac users can download their tool from the Web as well. The process is easy -- plug the camera into Ethernet and the included power adapter, set passwords, signup for mydlink.com, and that’s it. Once this process is complete, log into mydlink.com. I was immediately informed of a firmware update, which I applied, and then (after a prolonged connection lag) I got to see what the camera sees -- on the Web, although this required a power cycle before it worked. The next step was to configure wireless; this is done via the local Web server in the camera. Just log in, and the experience here is like that on most other contemporary residential-class network devices, like routers. Response, though, was sluggish, as is video responsiveness, and there are minor glitches in the user interface -- nothing too serious, though. But the overall performance, once the unit is operational, anyway, is more than acceptable. Motion detection can be configured. iOS and Android apps are available as well, as is a more sophisticated management package for Windows PCs that includes recording and multi-camera viewing. And there are no monthly fees for viewing or recording, as are becoming common with many cameras. It’s not the best Web camera on the market; it’s slow, and not terribly easy to use, but the DCS-930L is a good value regardless, and will provide hours of fun for geeks on your holiday list. 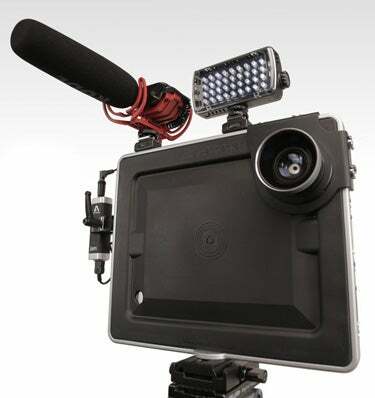 Buy this for: People who want to create videos with their iPads. The camera in the later-generation iPads (I’ve not tried the Air yet, so this applies to what are commonly called second-, third- and fourth-generation iPads) is really, really good, and capable of replacing a stand-alone still, and even video camera in fairly demanding applications. The problem, though, is that the ergonomics of the iPad are all wrong for other than casual work, or Blair-Witch-Project-style shaky-cam delights that invite nausea.